The Lenovo Z5s has finally been launched in China on Tuesday. The phone has a triple camera set up at the back and a dew-drop notch on top. Here’s take a look at the phone comparison with the Xiaomi Redmi Note 6 Pro. The Lenovo Z5s with a triple camera setup and a Qualcomm Snapdragon 710 processor is now launched in China at CNY 1,398 (Rs 14,000 appx). The price at, which the smartphone has been launched brings the device close to the Xiaomi Redmi Note 6 Pro, which is a quite popular smartphone in the mid-range segment. We are comparing these two smartphones to see which one is a better device when it comes to hardware at least on paper. 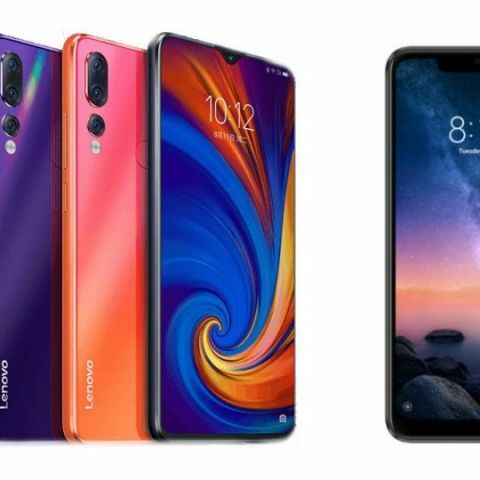 The Lenovo Z5s features a 6.3-inch display that offers a resolution of 1080 x 2340 pixels. The phone sports a tear-drop notch on top of it, which houses the front-facing camera only. On the other hand, the Xiaomi Redmi Note 6 Pro comes with a slightly smaller 6.26-inch notched display that offers a resolution of 1080 x 2280 pixels. Coming to the processor, the Lenovo Z5s is powered by a Qualcomm Snapdragon 710 processor, which is paired with 4GB RAM and 64GB internal memory. 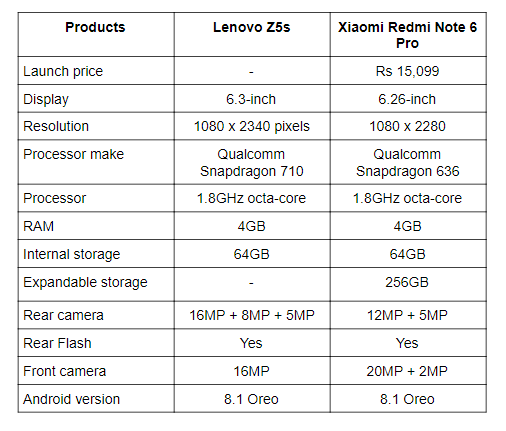 On the other side, the Xiaomi Redmi Note 6 Pro is backed by Qualcomm Snapdragon 636 octa-core processor, which is coupled with 4GB RAM and 64GB internal memory, same as the Z5s. As far as the cameras are concerned, the Xiaomi Redmi Note 6 Pro is the first smartphone by the company that has four cameras in total- two at the back and two on the front. It has a dual 12MP + 5MP rear cameras with 20MP + 2MP unit on the front. The Lenovo Z5s is also the first smartphone by Lenovo, which comes with a triple camera set up at the back. The device has 16MP + 8MP + 5MP rear cameras along with a 16MP sensor on the front. The Xiaomi Redmi Note 6 Pro is available in two variants - 4GB/64GB and 6GB/64GB, which are priced at Rs 13,999 and Rs 15,999 respectively. On the other hand, the Lenovo Zs5 has launched in China at CNY 1,398 (Rs 14,000 appx). Besides that, There is no official confirmation came from the company about its India launch yet.